And I don't believe in fairytales anymore, since I passed elementary school. Being extremely interested in the mechanics of the financial-markets, the moods of Mr. Market and the strange moves the Stock-Indices and Commodity-Markets can make, I experimented quite some time on how to establish a sound Long-Term-strategy. Eventually I came up with following the moves and streamline the length of the cycles. To avoid such fatal Drawdown-Periods like in the year 2008 one may adopt an adaptive rules-set to exit the Stock-Market, when there is weakness on the horizon or let's say: "When weakness is building up momentum". From experience one can learn, that the Investors' Money is more or less ALWAYS seeking to find a way where their money can work - so to say: "finding the last resort of return". Establishing an On-Off-Strategy therefore might involve handling ones Fear & Greed, AVOIDING LOSS-Aversion, embracing Risk-Taking (contrarian Buys) and reducing possible Overconfidence as much as possible. In these (more or less) 20 years, only 4 years turned out to be negative wiht the worst year being last year, 2015, with a Minus of -5.23%. But in 2016, the strategy is up more than 22% so far (all in USD-terms). 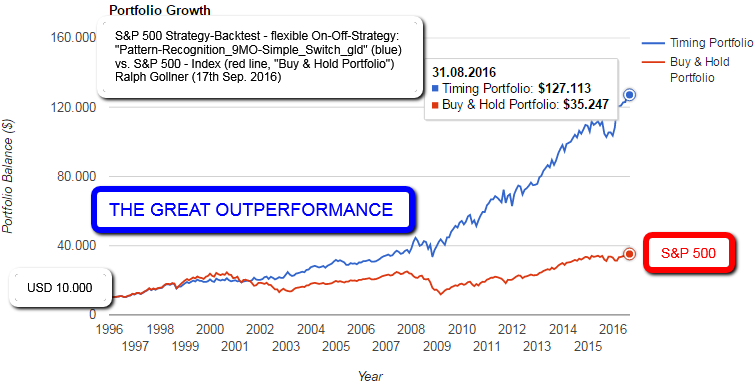 ♦ The best year for the "On-Off-Strategy" has been 2009 with > 36% Plus. ♦ The best long-run returns stem from avoiding the worst years in the benchmark/S&P 500. Therefore the nice outperformance in the years 2002 (> +13% versus < -23%) and the year 2008 have to be mentioned (> +3% vs. <-28%).